What is the Difference Between Coffee and Espresso: We’ll Let You Know! What is the Difference Between Coffee and Espresso: We’ll Let You Know! →What is the Difference Between Coffee and Espresso: We’ll Let You Know! What is the Difference Between Coffee and Espresso: We’ll Let You Know! Coffee is different from espresso. Chances are, you found this article because you do not know the differences between the two. From the method of preparation to their taste and aroma, there are variations between coffee and espresso. These differences are not too technical, and it is easy to understand. Keep on reading and we will help you to understand what is the difference between coffee and espresso. Once you are finished reading, you will surely gain valuable insights and you can easily educate your friends who might still not know how the two are different. They can both provide you with the caffeine fix that you are craving for, but it does not mean that they are the same. Before we discuss what is the difference between coffee and espresso, let us first take a look at the similarities. First and foremost, they are essentially made from the same beans and they can even be roasted in the same manner. The beans that are used in these two drinks can be made in the same manufacturing facility. Also, they both have caffeine content, but one has a higher level of caffeine than the other. Which is more caffeinated? We’ll discuss that later on. Lastly, both of the drinks are delicious. At the end of the day, it is personal preferences that will dictate how one is better than the other. Among others, they differ in the manner at which they are prepared. In order to prepare your coffee, there are various techniques that can be used, such as drip and F﻿﻿rench Press. Generally speaking, however, they have the same principle. You will use medium ground coffee beans. They will be placed in a paper filter. You will be using hot water with temperature of 200 degrees Fahrenheit. You will pour it on your coffee. When you pour the water, flavor will be extracted because of the heat of the water. There are also automatic coffeemakers, making the whole process easier, but still works in the same way. The preparation of espresso is much more complicated. You will need to have an espresso machine. The grind of the coffee is finer. Once the grounds are ready, you have to place them in a basket and have it tamped at about 30 to 40 pounds of pressure. This will make sure that there will be no space wherein water can pass in between the grounds. After this, you will have to put it in the group head and pressure will be used in order to extract liquid from your grounds. You will use a small amount of water. Without pressure, you won’t be able to come up with an espresso. The size of the drink will also be different. In coffee, you can have a cup or a mug, which will depend on the size that you prefer. Generally speaking, the size of one cup of coffee is eight ounces. Espresso, on the other hand, is smaller. It is in a shot glass, and more often than not, the size is only one ounce. In understanding what-is the difference between coffee and espresso, you should also know that the amount of the coffee grounds will differ. In one cup of coffee, around two tablespoons of coffee grounds will be used. On the other hand, in the case of one shot of espresso, you will need seven to nine grams. More so, the level of caffeine in these two will also be different. Because of the concentration of coffee ground in relation to water is more in espresso, some might think that it contains more caffeine. In reality, however, it is the other way around. One shot of espresso only contains 40 to 75 milligrams of caffeine. On the other hand, in the case of one cup of coffee, there is 80 to 185 milligrams of caffeine. Make sure to watch out for your caffeine intake. An average healthy adult should not have more than 400 milligrams of caffeine in a day. It is also important to note that the brewing time will be different. To brew coffee, you will generally need four to six minutes. On the other hand, for espresso, you will only need 20 to 30 seconds. Lastly, they will also be different when it comes to taste. 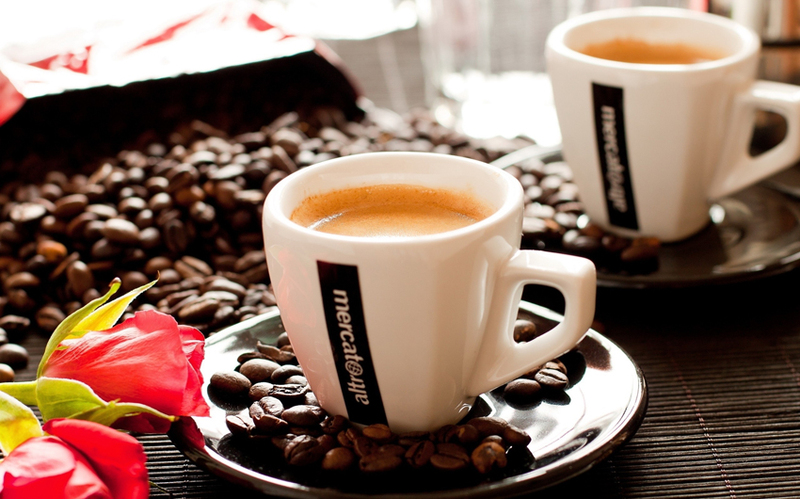 If you want fuller flavor and bolder aroma, espresso is the drink of choice that is highly recommended. There is also a perfect balance between sweetness and bitterness. In the case of brewed coffee, on the other hand, its coffee taste is lighter, especially when you use paper filters that could take out some of the flavor from the grounds.